T-Mobile has targeted Verizon a few times in the past, like with its Ball Buster Challenge, and now T-Mo and John Legere are going after Big Red again. T-Mobile today launched its #dontgetVerizoned campaign, which asks you to share any bad experiences you’ve had with Verizon and also vote on a new ad that T-Mo will put out. There are three ads to choose from, and you can view them all at the bottom of this post. You can cast your vote by retweeting your favorite ad on Twitter (ad 1, 2, and 3) or liking it on Facebook. 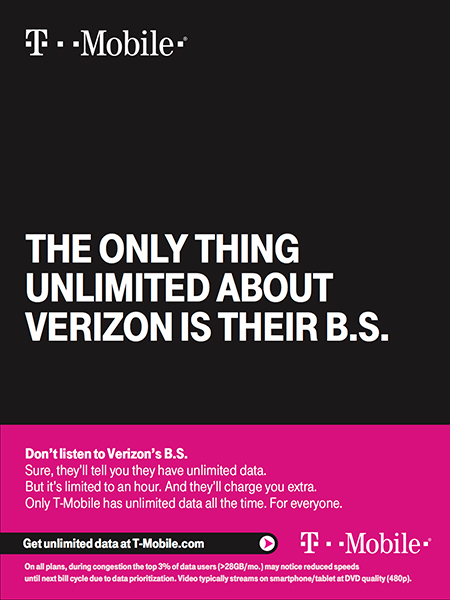 To go along with this new campaign, John Legere put together both a video and a blog post that counters some of the ads that Verizon has put out recently. 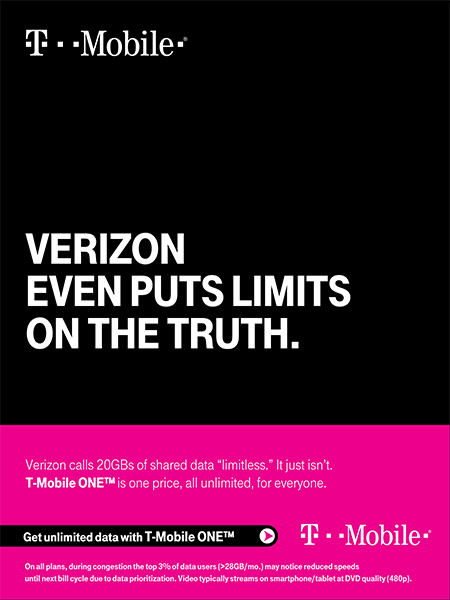 For example, Legere calls out the “Only on Verizon” tagline that accompanies many of the Google Pixel advertisements. T-Mobile recently launched a promo that’ll give you $325 in bill credits if you bring a Pixel to Verizon. You can check out all of Legere’s responses to Verizon’s recent ads in his blog post right here. 14+ year T-Mobile customer. Go T-Mobile! T-Mobile’s marketing team is very creative. Good thing they’re not with Verizon and AT&T otherwise we would be screwed. I think you meant bring to T-Mobile. Was going to post the same thing. $13.55 per month for 24 months. Wow. Ya all must live around a Tmobile tower, I live 2 miles from a large town in ky and you have to step outside to make a phone call on Tmobile. I lived in rural Louisiana before T-mobile even had their LTE network up and running, and HSDPA worked well enough for me on my Mytouch 4G Slide. Anyone remember that little gem? The camera was ahead of it’s time. Only good for band 4 not 12. The ether net one works anywhere, however. My Cellspot is using Band 2 which is awesome because 2 of the devices in the house are Verizon phones with TMO SIMs so they have a full signal now. Thank you for that I will see if I can get a new one. I have a cabin that maybe gets enough band 12 to work. The one I have is the 2, 4 old one and doesn’t work. I’ve been with T-mobile for over 6 years and they treat me like gold….before LTE and all with a smile on my face. They have been great to me, the customer service has always been top notch. Any issues I’ve ever had have always been taken care of. I dont know how long JL will be at the helm of Tmo USA but whomever replaces him I hope live up to his lofty legacy. If I were frequently driving the interstates I would probably be with Verizon, but through an MVNO. I’m not and I have perfect coverage 99% of the time in my areas of travel. How about they spend some of that $ upgrading the network ni San Antonio. It has been crap for almost 2 years and getting worse. Still love T-Mobile but service in Bellflower and Cerritos California is awful. Reps finally acknowledged it’s not gonna get better until about February. I got my new Pixel XL yesterday and quit T-Mobile after being with them for nearly 3 years and went back to Verizon. I can’t believe how I have conditioned myself to just accept a mediocre network. I am a field tech so I travel to many different places every day. It was nice actually having a usable signal in the same places that T-Mobile would have either no signal or a weak 1-2 bar LTE signal which would usually time out if trying to do anything. I did a few speed tests. With a weak signal in a few indoor locations which would have no signal under T-Mobile, I was pulling a very usable 2 – 6MBit/sec. With a full signal I was pulling between 40 – 80MBit/sec. The funny thing is, Verizon on a 1-2 bar signal is more usable than T-Mobile with a 3 bar signal. It’s all relative though. I think the Pixel phone shows less bars for same signal strength than the Samsungs do. Don’t get me wrong, when I had T-Mobile, in most cases it worked just fine for me, as long as I wasn’t outside any populated area or deep indoors somewhere, but for the amount of traveling I do, I need a service that I know I can depend on and not randomly perform slowly or not at all. I am paying $100 for the 12GB plan which includes a bonus 2GB for a total of 14GB with rollover data. I have never used more than 12GB/month with T-Mobile so this is definitely enough for me. I was paying $70/month for the T-Mobile Unlimited plan. I am willing to pay that extra $30/month for a service that actually works when I’m not in a major metro area. Yes, I got Verizoned lol. If T-Mobile at some point surpasses Verizon’s reliability and wins national and state root metrics, then I might switch back. Cool if it doesn’t work then leave, I dont understand why you have to gloat like if Verizon gave you award. Fortunately not everyone has the same experience as you and I like most T-Mobile customers are happy with their service. I constantly pull 50mbps down and 20mbps. I also dont have to meter my usage. I had a similar experience during my first 2 years with T-Mobile. Always super fast LTE and a great experience, I just overlooked the many times I was indoors in certain spots with no signal or 2G. I also overlooked the many times I traveled to the Poconos in PA and had unusable service. Over the past year, I’ve been having horrible slow speed issues even in areas with a full signal, and it was always the same tower IDs so it was not my phone. I could reproduce the same slow speeds by going to these exact spots, while others were super fast. The inconsistency is why I left. As I said, when T-Mobile works, it’s amazing, but I had too many instances of it not working. I drive Uber in Virginia. It amazes me when I have a passenger complain at how bad service is in some areas with Sprint and T-Mobile. But when they ask how I have coverage and say I have Verizon they say “oh, but it’s so expensive.” I ask how much they pay and find out they are “saving” about $20 a month. Some people will spend that in a week for Starbucks but won’t spend it to get reliable service? What else is crazy is how much less reliable would T-Mobile service be if they had 3 times as many customers? All things considered, I’ll stay with Verizon and pay the extra. Especially since my customers rely on me getting them to their destinations safely and accurately. Saving $20 a month isn’t much but for someone like me that has 4 lines saving $80 is pretty good. Hey I so happen to live right outside of a populated area without with issues with poor data speeds or call quality whatsoever. I also have been able to hit above 100mbps data speeds too Bro. I too can achieve speeds like that, just not consistently. I could be in one spot, and get 80 – 100, go to another get 0.5, again, 8 – 20, and so on. More often than I am comfortable with, I would get unusable speeds and having Google Maps tell me “Offline – no traffic data” despite having a full signal around my work area of Trenton, NJ. I was in Trenton today with my Verizon phone, and I had ZERO issues. Verizon is not always accurate wherever you go though within every other spot that you are in though. With T-Mobile-MetroPCS I’m still able to get above 100mbps or at least 90 or 60mbps data speeds in certain areas I’m always hanging out in at consistent times, that time. It all depends on the location, area, spot or blockage of signal somewhere that time. Verizon is excellent, but T-Mobile-MetroPCS has gotten so much better than AT&T/Sprint for the most part though. 7 years here, though never considered Verizon, due to their outrageous costs. I had T-Mobile. Unfortunately where I work I have to have verizon. I go into areas where at&t and T-Mobile do not get service. And Verizon gets at minimum a 3G signal. Which means I can still contact my boss when lets say the machine on the truck stops working…. so, for me it’s Verizon. I love T-Mobile though. I love what they do for their customers and I have to say they at least do good with that. But, saying their network is as reliable as Verizon’s is a bold face LIE! So, stop your sh$& legere. It all depends on the area you are at. I have friends that have Verizon and can not get service where I can with T-Mobile. So to say what you said is false. Yes Verizon most likely over all gets more service but T-Mobile is getting very close to them. I also have 48gigs on my Verizon plan. And I don’t use over that. I have 11 lines on my account and we don’t go over 20 gigs. So, we always have a ton of roll over data. I pay $130 (after taxes) for 10 lines of service with T-Mobile on a specialty plan. If they did not let me have this plan, I would have moved to an MVNO. However, I live with the coverage issues and use Wi-Fi Calling whenever possible. 3 of the people that are on my account travel a lot in areas that T-Mobile doesn’t get coverage. Myself included. While I love what T-Mobile is doing for their customers. Especially their business customers (I had a T-Mobile @work plan) I just unfortunately can’t keep service with them because they don’t work in the areas I need them too. And, id rather not go through an mvno and deal with their unsatisfying customer service. Straight talk is the best for the money in terms of mvno’s but I’ll never step foot inside a Walmart or sams club ever. So, I went through Verizon business class cell service. And, for what it’s worth it’s actually pretty good. They treat their business customers very well. They aren’t perfect with things and I’m sorry to say no company is get over it… but, with that said they do treat their business customers well. So, I’m content and happy with what I have. I heard something similar from a T-Mobile salesperson. But they didn’t disclose that they were on a unlimited Employee rateplan. What T-Mobile should do is create a new online map to show percentages of likeliness that any consumer rateplan won’t be throttled during the day in that area. Based on recent marketing and ads from T-Mobile, its a very important statistic; more important than coverage. I can assure you there is no special unlimited employee rate plan. We just get discounts on the same rate plans everyone else has access to. This video post makes me like John Legere even more. I wish other CEOs would act like normal people too. Normal people don’t wear a t-shirt with a picture of their emoji on it. Legere’s ego is very unattractive currently. He’s gone from being a bit of an upstart changing the industry for the better to an ego maniac who now talks and looks at himself in the third person. I find it very uncomfortable. I have been a T-Mobile customer for 10 years. I recently drove across the country from coast to coast while moving. I had very few times when I had signal issues. Unfortunately where I moved from and where I moved to have week signals at my house (due to the many trees) but I have T-Mobile personal cell-spot and use WI-FI calling at home with no problems. Don’t, however get me started on their absolutely horrible, customer service reps that do nothing, but lie! Creative marketing doesn’t undo the fact that TMO’s network is inconsistent. I live and work 12-15 miles west of Philadelphia, Pennsylvania and pretty consistently get 6 mgbps down and 1.8 mgbpm up on the fastest LTE network on the planet. CS always says I’m in a robust LTE signal area and blames the phone or the user for the inconsistent coverage. Tmobile doesn’t have the fastest lte on earth just in the USA. i know that don’t have the fastest network on the planet and clearly not in the USA unless 6 Mbps on the LTE network is considered lightening fast. You missed the humor. 6mbps is decent. Your not going to get 100mbps in the suburbs because there no need for tower densification out there when major development is going back into urban centers. I’ve been able to get up past 100mbps speeds in rural areas without any problems or issues whatsoever, especially in suburban areas too. It all depends on your area and location there. I’ve been with T-mobile for at least 10 years the service is getting better and better, most of the time I have a pretty good signal wherever I go. In rare cases when I am in rural places I lose signal I am going to stick with my 4 unlimited lines for $150. Three more agonizing months, at earliest, from what I can say. Extended range LTE is badly needed around northeast Aiken County. Also in northern Barnwell County. You might want to reword this. The way it’s worded it’s saying that T-Mobile will pay customers to go to Verizon.